God is asking us to surrender, to give up our ways, our plans and our opinions and to replace them with His ways, His plans and His truth. Why? Because God’s word tell us that “He has not given us a spirit of fear, but of power and of love and of a sound mind”. So, does that mean that we should feel empowered and smart and use our intelligence to make our way, form our plans and value our own opinions? No, that is not what that means. Why? Well, because this life we are living… it is not all about me. Oh, it is so easy to be self-centered, self-focused and lost in our feelings. It is hard to be God-centered, God-focused and lost in our faith. Our feelings are all about me and our faith is all about God. For those of us who love Jesus and have accepted Him as our Savior, we are called to live by faith and not by our feelings. Our feelings are not trustworthy and lead us astray. They are weapons of destruction that our enemy loves to use against us. So, we need to stop and remember it is not all about me. My life is to instead be all about Him. Who has He created me to be? What does He want me to do? How can He use me right where He has me planted? At the end of our life, two things will matter: Did I do what God placed me on earth to do? Did I share Jesus with everyone I could have? It will not matter how successful I was, who adored me, or how many people followed me on social media. It will not matter how much money I made, how big my house was or what I drove. It will not matter who was nice to me and who disagreed with me, who supported me and who came against me, who hung out with me and who talked about me. It won’t matter because it is not all about me. All that will matter, all that will remain is what we do for Him. Therefore, we should not shy away or retreat, instead we are to be bold for His glory. We are to step into what He is calling us to do because we do not do it in our own power. He is alive in us! Therefore, we shouldn’t let Satan use our feelings to stop us; we should stand on the truth of God’s word. We should remember His power is alive in us. God is love. Jesus came and showed us the perfect example of this love. We are to sacrifice ourselves and become more like Jesus. What does that look like? Well it means us taking our eyes off ourselves and instead looking at others. We learn to esteem others better than ourselves. When we love others well, then others see Jesus in us. We become a light in this very dark world, and even the lost see that we are different. This makes me chuckle. We can be a bit crazy, can’t we? Again, Satan wants us to ‘feel’ like we do not have our act together, to be emotional and feel that we are not very smart. But God has given us a sound mind and we are to use it. We know that we are to stand on the truth of God’s word. We have all the answers and instruction we need. Our sound mind means that we can have self-control. We can stop being reactionary and instead learn to respond lovingly and to do what is right in any circumstance. It also means we can be aware when someone is asking us to do things that might hurt others or lead someone astray. We can instead focus our minds and run everything we do and believe through the filter of ‘Who told you that?’ If we cannot answer, God or His word, then we need to rethink it. If our thoughts are not pure we need to take them captive and discard them. I am ready to be done with my spirit of fear, Satan can have that back. I surrender! I give up my old ways and today embrace that the power of the One True God is alive in me and therefore I can do what He asks of me. I choose today to love others the way that He loves me – unconditionally and without expectations. Today, Lord, help me to engage the sound mind you have so graciously given to me, to implore your wisdom and discernment and to take negative thoughts captive, so that I might be rid of them. Today, God help me make my life all about YOU. 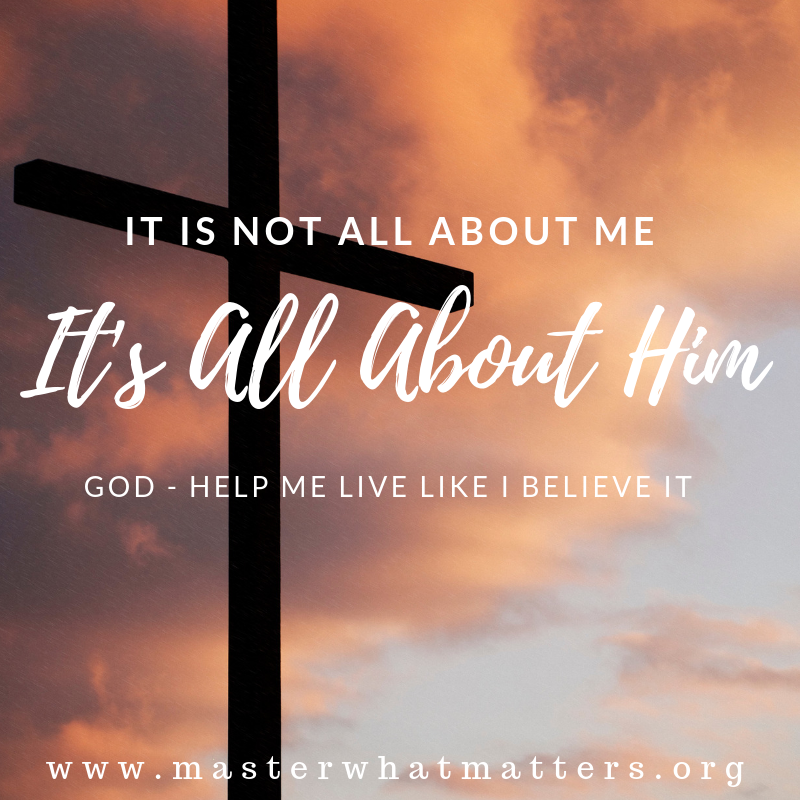 It is not all about me; it is all about Him. Today, let’s live like we believe that. Be sure to subscribe to this blog and you will receive a weekly post in your email. We need each other.